Touch underpins our social world and, evidence suggests, it may even help to reduce anxiety and provide pain relief. But can touch shape the actual organisation of our brains? Research is now revealing that experiences with touch – especially in infancy – do indeed shape brain development. This was recently demonstrated by a team of researchers, led by Nathalie Maitre, at the Nationwide Children’s Hospital in Columbus, Ohio. The researchers fitted 125 babies’ heads with electrodes and recorded their brain activity while their skin was lightly touched. First, they recorded the typical brain response to touch in full-term babies (babies born on or after 37 weeks of pregnancy). They then recorded the brain activity of babies born prematurely (before 37 weeks). Premature and full-term babies were matched by age. Compared with full-term babies, premature babies showed starkly reduced brain activity when they were touched. The researchers also noted a difference in the distribution of electrical activity across the scalp – that is, different parts of the brain became active at different times when they were touched. 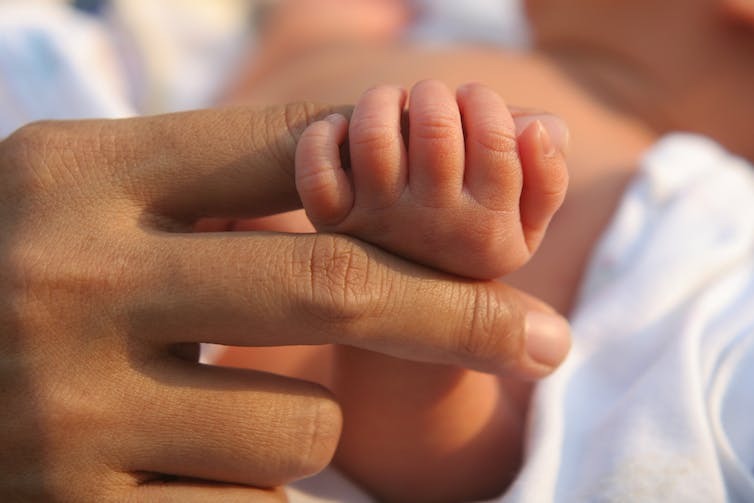 The researchers also showed, for the first time, that for premature babies the quality of touch while in hospital after birth (typically around one month) affected the functioning of the babies’ brains. When they tested the premature babies, just before they were discharged from hospital, they found that the more they experienced pleasant, nurturing touch (such as breastfeeding or skin contact) the greater the brain response to touch. Conversely, unpleasant touch, such as skin punctures and tube insertions, were associated with reduced brain activity. This demonstrates that our sensory experiences in early life have important effects on brain function. Maitre’s findings add to the growing understanding that the functioning of the brain cannot be considered separately to that of the body. The sensory system supporting touch and bodily sensations is the earliest to develop in humans and may form a basis for many processes that come later, such as the development of other senses, and social and cognitive development. This may be why abnormal sensory processing is a strong predictor of health problems and learning difficulties in later life. Another study that highlights how early experiences with touch can shape the brain and behaviour in later life was published in Cell last year. This work, by researchers at Harvard University, found an association between hypersensitive touch in mice pups and psychological problems that resemble aspects of autism. The researchers caused mutations of genes associated with autism in the skin of mice, causing hypersensitivity and a change in texture perception. (Hypersensitivity to touch and certain textures is being increasingly recognised as a symptom of autism – alongside traditional social and communication problems.) Even though only the skin, and not the brains, of the mice had been altered, they became less sociable and were more anxious. These psychological effects were only seen when touch was altered in young – but not adult – mice. Overwhelming tactile sensations during a child’s exploration of the world might cause them to withdraw, leading to delays in language development and social skills. Similarly, being blind or deaf may affect a child’s behaviour and brain development through a form of sensory-imposed social deprivation. Maitre provides insights into how experience shapes our mind, but her study also has clear relevance for the care of newborn babies. Body contact may be useful in promoting health, particularly in premature babies, giving the world the extra excuse – as if it needed one – for cuddling cute babies.